Just Add Water: Chain of Command Jump Off Markers for North Africa? Chain of Command Jump Off Markers for North Africa? 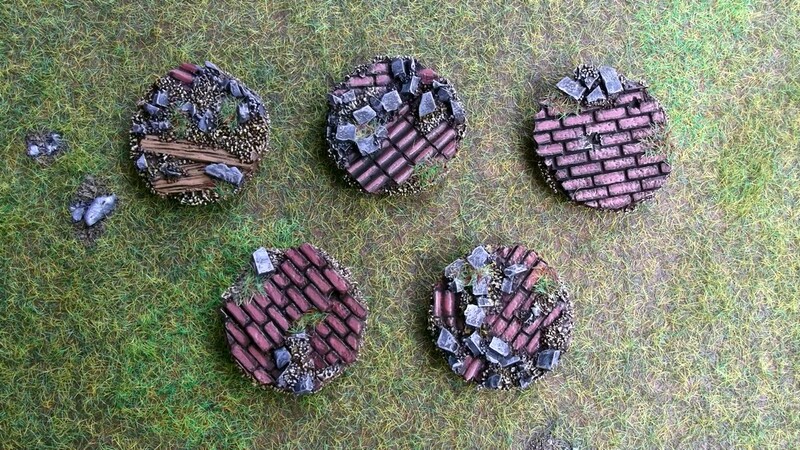 I've just seen Matt of The Wargames Table Blog's excellent post on some beautifully subtle Chain of Command Jump Off Markers (Pic below) and it set me to thinking...... I'm going to be doing my Chain of Command forces for the North African campaign using mainly Perry Miniatures and i wanted something just as subtle for my own Jump Off Points. 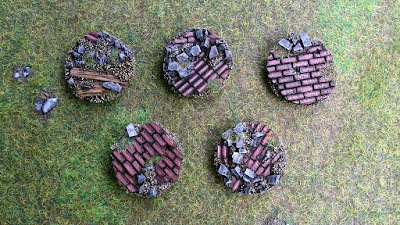 It's easy to picture a burned out tank or a rusty piece of kit left to rot in the desert but they would in all likely hood be too large for the bases which have to be reasonably small from what I have gathered(?). I am open to ideas if anyone out there has any? I haven't a clue how the game works (though I do have the rules book) but aren't the JOP just tokens that are immediately removed from the tabletop at the beginning of the first turn? Or are they used as 'blinds' as well? If they're just tokens then I'd say don't waste time and money on something nonessential - If you really must then use Afrika Korps / 8th Army badges to tart them up. If they're to serve as blinds too, and represent hidden movement, then an easy option would be to use the Perry Muslim Civilians from their Crusades range. There's six figures in that pack, I don't know how many you'd need, but it would give you some choice - even if you only made two JOP using the civilians it would be something different. Perhaps instead of an abandoned vehicle you could use some discarded equipment on the markers - jerry cans, oil drums, ammunition cases? Yeah, I'd thought of that but wanted something really subtle- desert debris.... an abandoned vehicle would take up too much space on the marker I think(?). A Minefield sign! That's an iconic image from the Desert war. I'm with Tamsin - discarded helmets, rusty rifle, dead fire and billy can etc etc. Yeah, discarded helmets, rifles etc could work. I went away and looked up what these JOP are for, so I've a better idea now - Is your emphasis on subtle? * Broke road sign (the post snapped off and the rest of the post and sign laid on the ground - face down if necessary). * Barbed wire (if placed on a small circular base and possibly featuring some debris that has blown into it then it shouldn't get mixed up with any actual terrain item). * Scrap metal from a British cruiser tank - painted two-tone camo with the blue colour.